Without Christ, the New World Order is neither New, nor in Order. The The First Class Feast of the Kingship of Our Lord Jesus Christ. Psalm 18: 2-4, 47, 51. 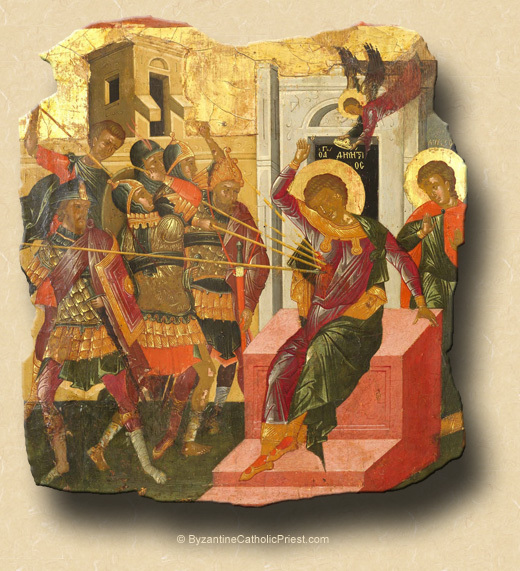 The Feast of the Holy & Glorious Great Martyr Demetrius. The Commemoration of the Great & Fearful Earthquake of 740 in Constantinople. From the Encylical Letters of Pope Pius XI. Litt. Encycl. "Quas primas," diei 11 Decembris 1925. This kingdom is spiritual and is concerned with spiritual things. That this is so the above quotations from Scripture amply prove, and Christ by his own action confirms it. On many occasions, when the Jews and even the Apostles wrongly supposed that the Messiah would restore the liberties and the kingdom of Israel, he repelled and denied such a suggestion. When the populace thronged around him in admiration and would have acclaimed him King, he shrank from the honor and sought safety in flight. Before the Roman magistrate he declared that his kingdom was not of this world. The gospels present this kingdom as one which men prepare to enter by penance, and cannot actually enter except by faith and by baptism, which, though an external rite, signifies and produces an interior regeneration. This kingdom is opposed to none other than to that of Satan and to the power of darkness. It demands of its subjects a spirit of detachment from riches and earthly things, and a spirit of gentleness. They must hunger and thirst after justice, and more than this, they must deny themselves and carry the cross. Christ as our Redeemer purchased the Church at the price of his own blood; as priest he offered himself, and continues to offer himself as a victim for our sins. Is it not evident, then, that his kingly dignity partakes in a manner of both these offices? It would be a grave error, on the other hand, to say that Christ has no authority whatever in civil affairs, since, by virtue of the absolute empire over all creatures committed to him by the Father, all things are in his power. Therefore by Our Apostolic Authority We institute the Feast of the Kingship of Our Lord Jesus Christ to be observed yearly throughout the whole world on the last Sunday of the month of October - the Sunday, that is, which immediately precedes the Feast of All Saints. We further ordain the dedication of mankind to the Sacred Heart of Jesus, to be renewed yearly. 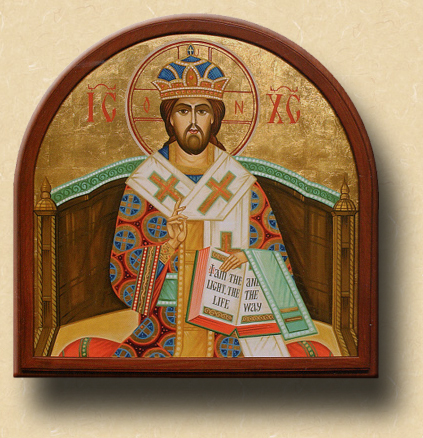 Homily of St. Augustine, Bishop. Tract. 51 in Joann. 12-13; Tract 117 in Joann. 19-21. What great matter was it for the King of all worlds to become King of men? For Christ was not King of Israel for exacting of tribute, or arming a host with the sword, and visibly subduing enemies: but King of Israel that he should rule minds, that he should counsel for eternity, that he should bring unto the kingdom of heaven them that believe, hope, and love. Being then, Son of God, the Word by whom all things were made, that it should be his will to be King of Israel is condescension, not preferment, a betokening of mercy, not an increasing of power. For he who was called on earth King of the Jews is in heaven Lord of the Angels. But is Christ King of the Jews only, or also King of the Gentiles? Yea, of the Gentiles also. For when he said in the prophecy: But I am set by him as King upon Sion his holy mountain, preaching the precepts of the Lord, lest on account of the Mount Sion, any should say that he was set as King only of the Jews, he hath straightway subjoined: The Lord hath said unto me, Thou art my Son: this day I have begotten thee. Ask of me, and I shall give thee the heathen for thy inheritance, and the uttermost parts of the earth for thy possession. Tract. 115 in Joannem 18-36. Jesus answered: My kingdom is not of this world: if my kingdom were of this world, then would my servants fight, that I should be delivered to the Jews; but now is my kingdom not from hence. This it is which was the will of our Good Master that we should know: but first we were to be shown the vanity of the opinion concerning his kingdom, entertained by men, whether Gentiles or Jews, from whom Pilate had heard that: as if the reason why he must be punished by death, were that he had affected a kingdom to which he had no right; or because the reigning are wont to look with an evil eye upon those destined to reign; and there were indeed need to beware lest his kingdom should be adverse either to the Romans or the Jews. Now the Lord might have answered at once: My kingdom is not from hence: to the first question put by the governor, Art thou the King of the Jews? But in putting a question in return, namely whether he spake this of himself, or had been told it by others, it was his will to show by Pilate's reply that this had been laid up to him as a crime by the Jews in their conference with the Governor: thus laying open to us, the thoughts of men, which he knew: that they are vain: and to them after Pilate's answer, making a reply which was more reasonable and suitable to Jews and Gentiles: My kingdom is not of this world. * The decision to transfer the feast known popularly as Christ the King to the last Sunday of Ordinary Time from it's original date, the Sunday before All Saints, is not without controversy. As is clearly evident from his encyclical creating the feast, Pope Pius XI clearly viewed the sovereignty of Christ as being exercised in the here and now, as the source from which all secular authority flows, and to which all civil law must be subordinate; thus, the Collect for today in the Extraordinary Form, which includes the phrase: “Grant that the family of the nations, torn apart by the wound of sin, may submit to the soothing action of His Supreme authority.” The saints were particularly those among us who had submitted completely to the authority of Christ over their lives, giving the perfect example for individuals and nations—thus, the link between the Feast of Christ the King and the Feast of All Saints which it immediately precedes. The feast would be an important spiritual inspiration in the Catholic Church's fight against racial discrimination in the southern United States in the first half of the 20th Century, as it stood as a reminder that Christ is the only true ruler of any man, and this was not out of the mind of Pius XI when he established the feast, even if not explicitly mentioned in Quas primas. The transfer of the feast to the last Sunday of Ordinary Time in the Ordinary Form was accompanied by a change in title, making clear the intention of Pope Blessed Paul VI to change the meaning of the feast from that envisioned by Pope Pius XI: the Solemnity of Our Lord Jesus Christ, King of the Universe, in the Collect for which we pray “…that the whole creation, set free from slavery, may render your majesty service and ceaselessly proclaim your praise.” The other texts of the Mass, including the Scripture lessons for all three cycles, focus on the eschatological theme of Christ's rule over nature and the cosmos, rather than to Divine Authority over the civil order or the sovereignty of Christ as the source from which all authority on earth flows. Thus, the link to the Solemnity of All Saints, and the pedagogy derived thereof, are not present in the observance of the Ordinary Form. ** Due to the "Lucan Jump," the Gospel read today in the Byzantine-Ruthenian Rite is that for the 22nd Sunday after Pentecost, the Fifth after the Holy Cross.